Stops: Controls if you would like direct only options or are ok with swapping planes. Extra stops: Increases the numbers of stops you want beyond the least it finds. So if it can find a nonstop flight and you set this to one it will show flights with one stop. So overall, the extra stops option is relative to whatever routing (including your other filters) has the lowest number of changes possible. If you want to change as little as possible, set it to No Extra Stops, of you'd be willing to add extra stops beyond the minimum to say get an airline you prefer more, a cheaper fare or if the other routes involve very long connections then you may wish to increase it. Stops is the maximum number of stops that you want to have, regardless of other settings. Indicate the number of extra stops you are willing to make beyond the minimum number of stops possible. For example, if there are nonstops, setting this to 1 will only return nonstops and 1-stops. If there are no nonstops, but there are 1-stops, setting this to 1 will return 1-stops and 2-stops. An example will probably show this best. You are searching for flights from Toronto (all airports) to Venice (all airports). Air Canada (And Lufthansa via codeshare) fly this route direct, so the minimum number of stops possible for this flight is 0. If you have "Extra stops" set to 1, then Matrix will show you flights that have between 0 (the minimum) and 1 (0 min + 1 extra) stops. If you change Extra Stops to 2, then it will show flights with between 0 and 2 stops. If instead you change your origin airport to Toronto City Airport (YTZ) you'll see different behavior. There are no direct flights between YTZ and Venice - the minimum number of stops required is 1 (eg, via Montreal). So for this flight, setting "Extra stops" to 1 will give you flights will either 1 or 2 (1+1) stops. Setting it to 2 will give you between 1 and 3 (1 minimum, +2 extra) stops. Setting Extra Stops to "No Extra Stops" will only show you the options with the lease number of stops. eg, for "All Toronto airports" to Venice it'll only show you direct flights. 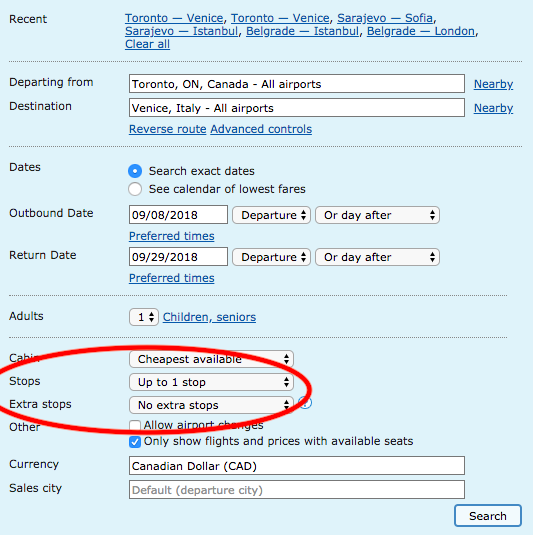 For Toronto City to Venice it'll only show you 1-stop flights (as there are no direct flights). Keep in mind that Matrix will only return a maximum number of flights for any search. The more you open out the search criteria, the more likely it will not show flights that might match your criteria. For setting this to "3 extra stops" will not necessarily show ALL flight options that have 3 extra stops, as there could be thousands of such possibilities which is above it's maximum results. Not the answer you're looking for? Browse other questions tagged air-travel price flight-search-engines or ask your own question. What is the difference between D and X fares in JL?